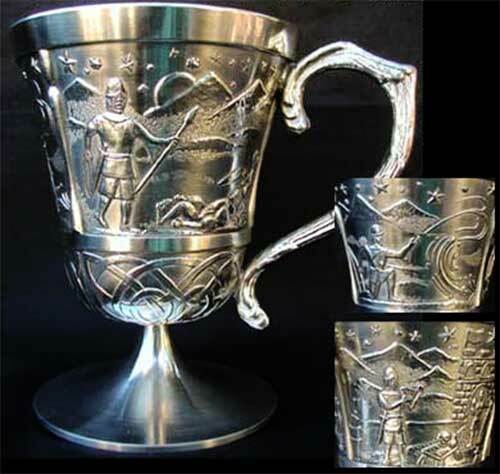 This Celtic tankard features the King Lugh legend embossed on the pewter panels. The pewter Irish legend tankard is enhanced with Celtic knot-work under the panels and it is further enhanced with a footed base along with an embellished handle. The King Lugh tankard measures 3" wide at the rim x 4" tall; it holds 8 ounces. This Mullingar Pewter Tankard included the following Irish legend card. loved Kian who was father of her triplet sons. The second battle of Moytura saw the Tuatha de Danaan victorious over the Fomorians. Balor, as a result of battle weariness, allowed his infamous eye to droop for a few moments. Lugh picked up a stone and waited until Balor opened his eye. Hurling the stone with his mighty strength Lugh sank it into his evil eye destroying his brain. Balor lay dead. The Fomoriams were routed.